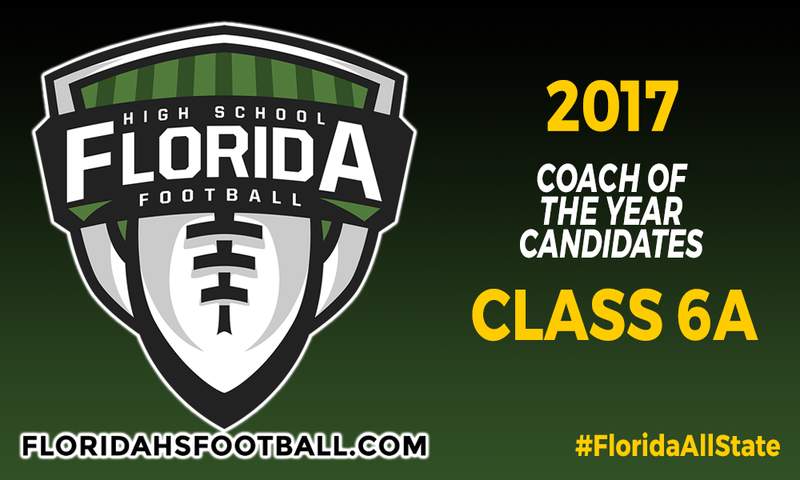 GAINESVILLE, Fla. — With the final step to fully closing the 2017 season is almost here, we are proud to reveal our candidates for our Class 6A Coach of the Year candidates. For Coach of the Year, five coaches are selected as candidates based upon the resume they had for the season. For Player of the Year, three players are selected on offense and three on defense as candidates for Offensive Player of the Year and Defensive Player of the Year. One player from each classification of the six candidates total will be selected as the Overall Player of the Year for their respective classification. • Max Edwards, Miami Northwestern (12-2) – Smith led the Bulls to their first state championship game appearance since 2008 and their first state championship win since 2007. • Evan Davis, Seffner Armwood (14-1) – In his first season as head coach at his alma mater, lead the Hawks to a perfect regular season and to their fourth state championship game appearance in five seasons. • Brian Braddock, St. Augustine (12-1) – An alum of St. Augustine, Braddock led his alma mater to their ninth perfect regular season as under the St. Augustine and Ketterlinus High School names and their deepest playoff run since 2010. • Bill Kramer, Naples (10-2) – Guided Naples to their second state semifinal appearance in three years in a year that saw Naples directly impacted by Hurricane Irma. • Andy Schmitz, New Port Richey Mitchell (11-1) – Lead school to their first perfect regular season in school history and the school first playoff win since taking over his father Scott in 2014.